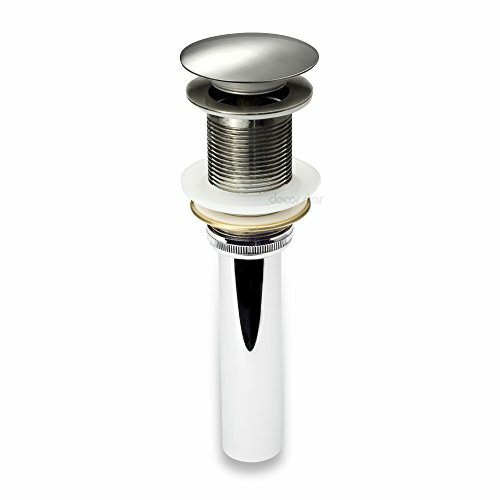 PU-001-TB 1 5/8" modern contemporary bathroom vanity & vessel sink pop up drain stopper without overflow. Brushed nickel finish. By Decor Star, the trusted brand in bathroom fixtures since 2009. Backed by limited lifetime manufacturer warranty with US based customer support. - Limited Lifetime Manufacturer Warranty (USA Only) w/ US Based Customer Service. - Vessel sink or bathroom vanity sink with minimum drain hole diameter of 1 5/8"
- Drain Height (Pop Up Open): 8 ½"
- Drain Height (Pop Up Close): 8"
Fits vessel sink or bathroom vanity sink with No overflow and minimum drain hole diameter of 1 5/8"
If you have any questions about this product by Decor Star, contact us by completing and submitting the form below. If you are looking for a specif part number, please include it with your message.